At the Office of the Permanent Secretary, ministry of science and technology (MOST). (On June 14, 2016) - At the Office of the Permanent Secretary, ministry of science and technology (MOST). H.E. 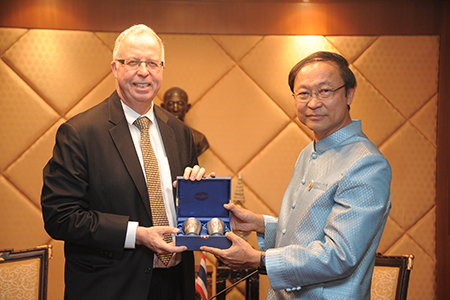 Mr. Philip Calvert, Canada’s Ambassador to Thailand paid a courtesy call on Dr. Pichet Durongkaveroj, Minister of Science and technology and his team. In this courtesy call occasion, they have discussed cooperation in science, technology and innovation. For example, Thailand Institute of science and Technological Research (TISTR) interested to signing of a joint memorandum (MOU) on pharmacy, materials science and energy.